If you wanted to collect all Sentinel satellite data for a given region of interest (ROI), say, for a given day or time frame - is there any simple way to do it? That means: Without having to download all the full images manually and cropping the ROI subset manually as well afterwards? You can visualize and export sentinel images for a given ROI (customizable by user input shapefile, kml, etc) in a few lines of code. There are many demos available online. 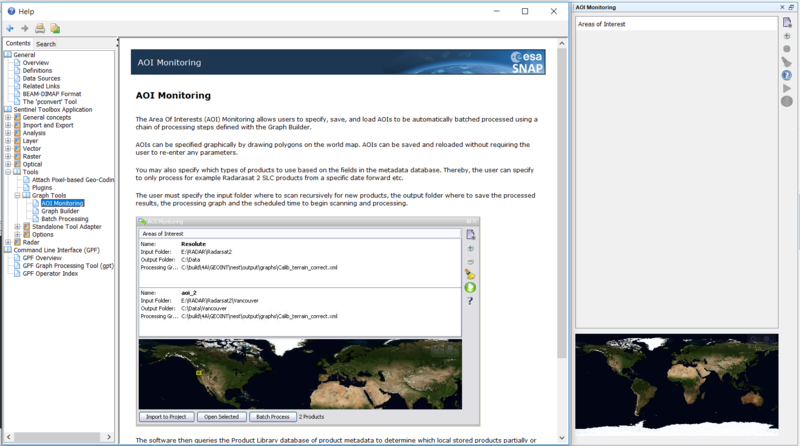 The latest release of ESA SNAP (6 beta) features so-called AOI monitoring. It allows you to define a region of interest, schedule searching for the data and apply processing chains (as defined with the graph builder) on the data automatically. And with the new sci-hub integration you can download S1 data directly in SNAP (you enter the same user credentials as on https://scihub.copernicus.eu/). However, I don't think that only downloading subsets works by now. The whole product is retrieved but as soon as you integrate the subset operator in your graph, only the desired area is proessed. One option to automate downloading part (but not also cropping) would be to use a combination of OpenSearch API (http://opensearch.sentinel-hub.com/resto/api/collections/Sentinel2/describe.xml) and Python downloader (https://github.com/sinergise/sentinelhub). Not the answer you're looking for? Browse other questions tagged data remote-sensing sentinel-2 sentinel-1 sentinel-snap or ask your own question. Extracting pixel values by points from multi-band image and converting to table in Google Earth Engine?